Corner trusses are stouter consisting of an inside and an outside 4x4 corner connected with paired 2x4 gussets. Although they are more complex, the following jig greatly simplifies their construction. Frame a base platform of 2x4’s with ¾” plywood screwed to the top. The platform will measure 24” wide x height of truss. Screw a cradle component to the platform at top, center and bottom locations per illustration. Screw a 2x4 gusset stop, centered on top of each cradle. Attach 4x4x7”gusset stop bases to platform per diagram, and then attach 2x4’s to top of gusset bases. Note the bottom gusset stop is placed so that the bottom of the first gusset is located 1” from the bottom of the studs to provide for an electrical raceway and aligning the resulting corner gussets with those of the straight trusses. Screw a plywood foot to the bottom end of the jig per diagram below for accurate bottom alignment of the truss. Each corner truss will consist of 2-4x4’s connected with double 2x4 gussets @ 24” o.c. vertically. Precut all 4x4 corner posts to length. 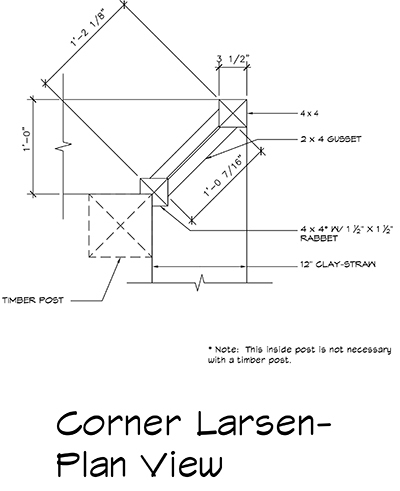 Rabbet all inside corners per diagram on a table saw or a skill saw with a fence. 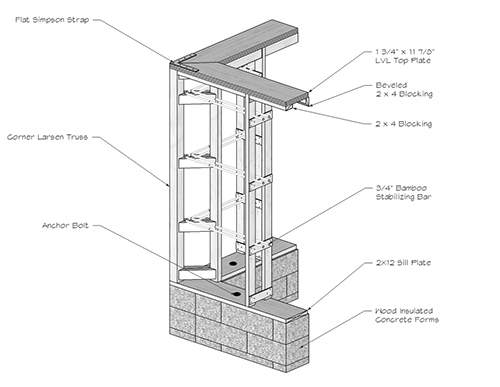 This rabbet detail facilitates attachment of formwork. If the exterior is to be finished with plaster with rounded corners, miter outside corners for desired radius. Typically we do a 1”x1” miter. 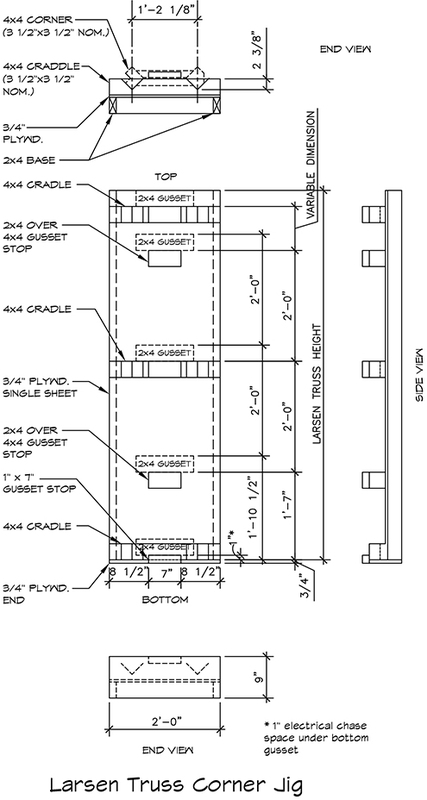 Precut all 2x4 x 12-3/4”(longest dimension)) gussets with 45 degree mitered ends per illustration. Tip: The 12-3/4” length deliberately creates a gap between the pair of gussets and ensures a tight fit to the 4x4s despite any slight lumber distortion. Set jig on work table to a comfortable working height. For maximum efficiency a pneumatic nail gun is used with 3” nails for fastening the gussets to studs. 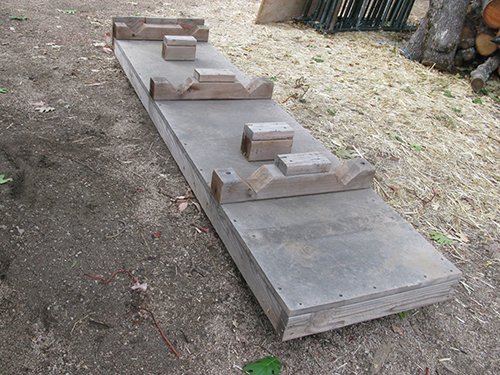 Load jig with two posts aligned with bottom foot. Fasten the gussets with 2 fasteners per connection. 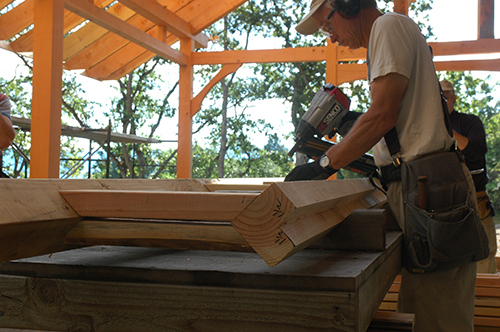 Label the top gusset to ensure that trusses are installed right side up. Photo 8-3 Student fabricating corner Larsen Truss in jig. For more detailed information on designing and building your own light straw clay house, purchase our book, The EcoNest Home. You can also find information, ideas and inspiration in our books, Prescriptions for a Healthy House and EcoNest: Creating Sustainable Sanctuaries. You can purchase all three books here.